The ViewSonic V3D241wm-LED 3D-capable 120Hz LCD monitor is not a new model, it was announced back in 2010, but I just recently had the chance to get my hands on it, so I’ve decided to run some tests on it as it is still available and can be purchased and thee aren’t many reviews of it available. 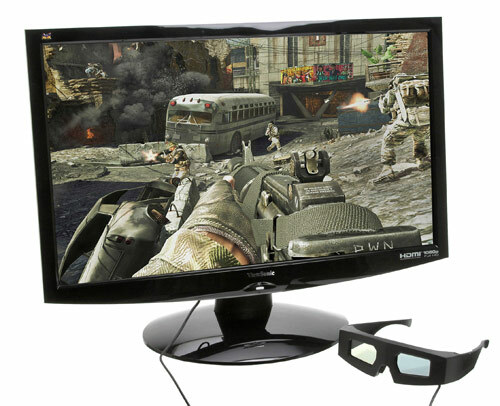 What is interesting about this particular 3D monitor from ViewSonic is the fact that it comes bundled with a pair of wired glasses that connect directly to the display itself and not to the computer. Originally this monitor was intended to be used with the iZ3D Driver and be compatible with both Nvidia and AMD-based graphics, but since the development of that software has been ceased for some time (the driver is still available for download) I also wanted to see what other options do you have in using it in 3D at the moment. The fact that the iZ3D driver is not longer in development means that although the old version of software may work, it may not work well with newer games. For example I could not make the latest version of the iZ3D software work at all under Windows 8, though I still managed to make the monitor work in stereo 3D even under Windows 8, but not with the iZ3D driver. 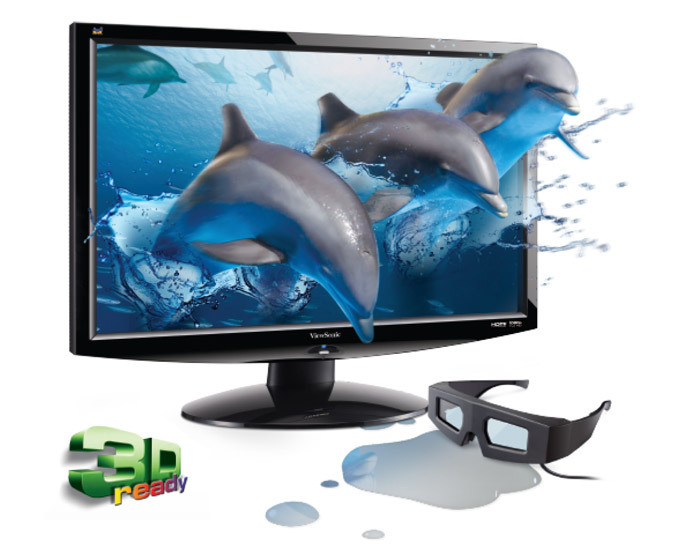 If you are a long time stereoscopic 3D user like me you may remember seeing and even using active shutter glasses like the ones on the picture above that are shipped with the ViewSonic V3D241wm monitor. I have seen very similar design 3D glasses back in the 2000 with GeForce 2 graphics, though they were not completely identical in the design, the shutters are probably the same. Using the ViewSonic glasses in 3D mode they make the black color grayish and generally the look and feel of the image gets colder, other than that and the fact that they look old school and and not overly comfortable for wearing they do perform decent. Another thing that I did not like much about these glasses is the fact that their cable is not very flexible and you’d want a more flexible cable when you have to connect the glasses with a wire to the display. The good news with the ViewSonic is that it works just fine with a 3D Vision Kit and there is not even the need to use and EDID override driver, you can just enable the Generic CRT Display mode that was removed a while ago from the 3D Vision drivers, but is now apparently back. 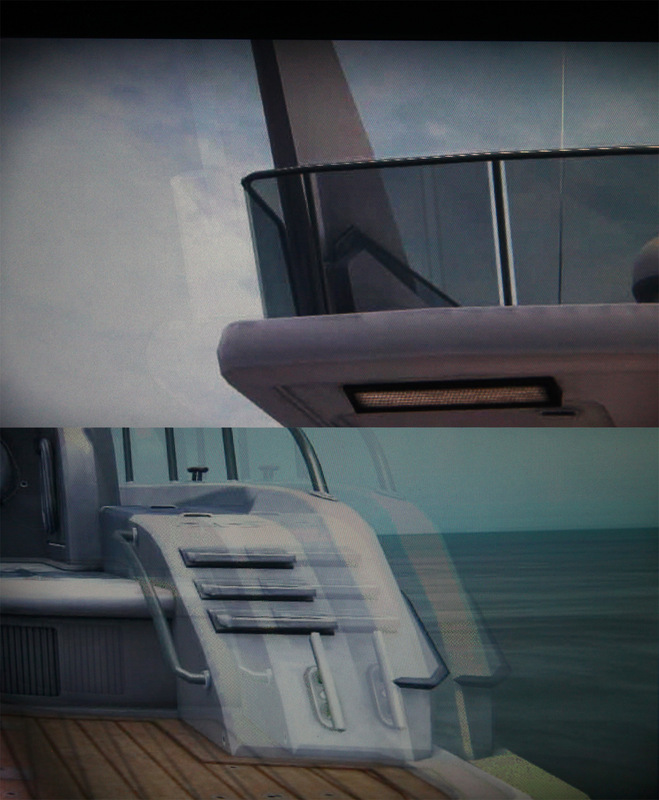 In fact using an EDID override from another 3D Vision-ready display produces worse ghosting/crosstalk as compared to when using the Generic CRT mode. Due to the fact that I was not able to make the iZ3D Driver work I was not able to compare with the results achieved when using the Generic CRT Display mode, but I suspect that the level of ghosting/crosstalk would be a bit less with the iZ3D software. The good news is that with the Generic CRT Display mode enabled from the 3D Vision drivers you can use both the ViewSonic 3D glasses as well as 3D Vision glasses and they produce pretty much the same level of ghosting/crosstalk though the image seems warmer when viewed through the 3D Vision glasses. You however need to have a 3D Vision IR emitter connected to the computer in order to be able to enable the Generic CRT Display mode, so even only with an emitter connected you could use the wired glasses. Here is how the display performs in terms of color reproduction, the first image shows the performance of the out of the box factory settings and the second one is after we’ve calibrated the monitor. We’ve measured maximum brightness level of 260 cd/m2 and that is with the default setting of 70 for Contrast and after calibration the color accuracy improves a bit with the brightness staying above 200 cd/m2. Have in mind that these measurements were made using the 60Hz refresh rate mode of the display as as long as you activate 120Hz the monitor enters in 3D mode automatically and the brightness gets reduced significantly. This happens only at 120Hz refresh rate, at the lower 110Hz and 100Hz refresh rates the image is brighter, though 110Hz is not useable for stereo 3D mode with the Generic CRT display mode, but the 100Hz is. 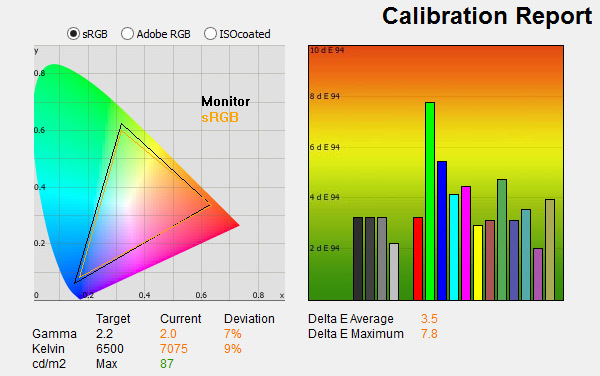 These are the readings of the display’s color performance when it is running with 120Hz refresh rate without calibration, as you can see the 3D mode is with a maximum brightness level of just 87 cd/m2, something similar to what happens when you activate the 3D Lightboost technology on a more recent display, though the panel used here does not feature a scanning backlight as the 3D Lightboost-enabled monitors do. The monitor uses a CMO M236H5-L0A LCD panel, something very similar to the one used by the Acer GN245HQ 3D-capable display. The only good thing here is that the black point measures at just 0.09 Cd/m2 so you still get a contrast ratio of almost 1000:1 even though the brightness level is a bit below the comfortably useable level for most people and the perceived brightness gets even lower when you put on the shutter glasses. This could’ve been acceptable only if it has helped in significantly reducing the level of ghosting/crosstalk that you would normally get, but unfortunately it did not help much. It is time to check the crosstalk performance of the monitor in stereo 3D mode, first is the test with the extreme crosstalk photos. The results are wore that what we are used in seeing in the more recent 3D-capable displays, but you should not forget that this is in fact a 2010 model of 3D display, so for back at that time the situation wasn’t that bad when comparing to other available products. 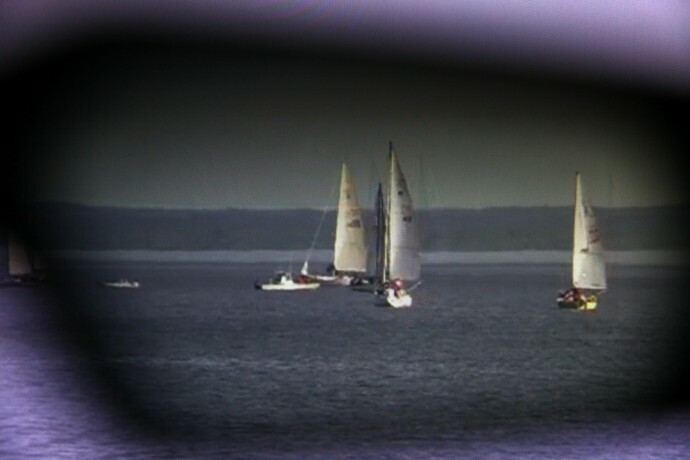 Next is the sailboats stereoscopic 3D test video for more real-world performance comparison, here we see a bit of ghosting and it is mostly what I use to call color ghosting/crosstalk that is a direct result of the use of an Overdrive technology to make the pixels respond faster. In this test the performance is a bit worse than on other 3D displays from that period. The other test for crosstalk/ghosting using a real world game example to measure, namely Tomb Raider: Underworld also shows not so good performance in terms of crosstalk. Both on the top and bottom parts of the display there is quite a lot of crosstalk available, though the fact that we are using the Generic CRT Display mode for these tests may also be a reason to have a bit more ghosting/crosstalk, it is not a reason enough to have a color ghosting as you can see at the bottom. 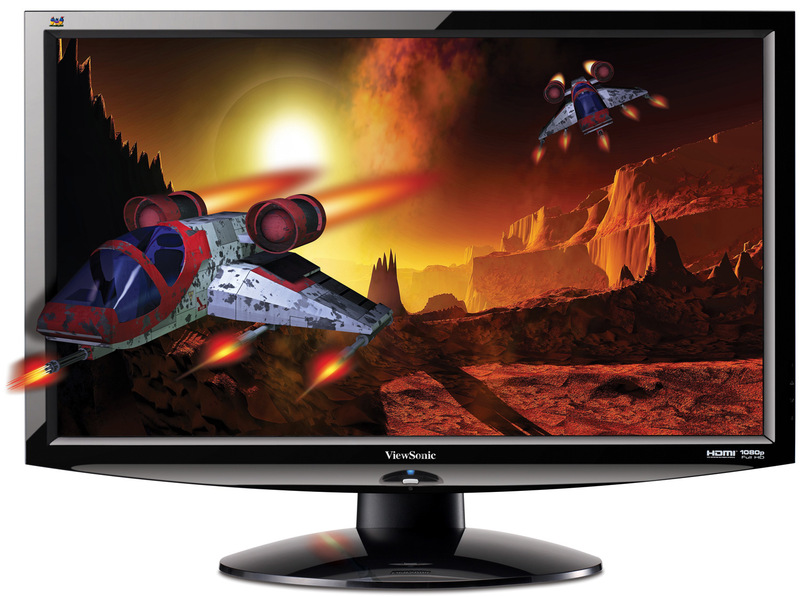 One of the best things about the ViewSonic V3D241wm-LED 3D-capable monitor is the fact that it has very little input lag and feels very responsive in 120Hz refresh rate, though the brightness is a bit low, though is a darkened room it feels very natural also because of the very low black level. 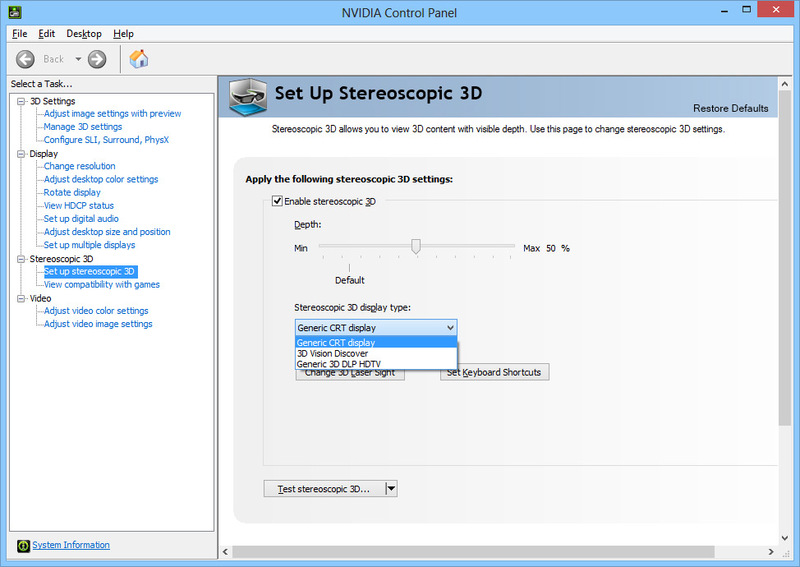 By using an EDID override you can also have higher brightness in 120Hz if you don’t need the stereo 3D mode. I’ve measured up to about 7ms input lag as maximum with the help of a custom device for measuring input lag that I’m currently working on (more details about that when the project is finalized). The crosstalk/ghosting performance of the display is not very good and is far form what the latest offerings on the market have to offer, so not much point in getting this display new at the moment, but it might not be a bad choice if you get a good deal with a very attractive price and you don’t plan on using it in stereo 3D mode. If you plan on using it in stereo 3D mode the good thing is that even though the iZ3D Driver is no longer supported and developed you can use the display with the 3D Vision software, you might also be able to make it work with the TriDef 3D software on ATI/AMD-hardware, though I was not able to test that personally, so there is no guarantee if it will work. With this said, if you were already able to get a hold of one of these new 3D-capable monitors from Viewsonic (they are not 3D Vision compatible!) you are welcome to share some actual photos of the monitor and the glasses, as well as share your experience with the product – setting things up, using together with the iZ3D driver that it comes with, information on what performance you are getting with your video card and so on. If you are more experienced with stereo 3D-capable monitors, then you are welcome to share your thoughts about the performance of the display in 3D mode compared to other solutions you’ve seen so far like 3D Vision-capable monitors, or 3D HDTV and even 3D DLP projectors for example. Of course you are more then welcome to run some tests and share the results in the comments below as well, for example the stereo 3D crosstalk test photos I’ve shared here in the blog or photos showing the level of ghosting in Tomb Raider Underworld – the game I use for testing monitors here on the blog etc. You can also compare and post your findings about color reproduction and input lag as well if you are able to measure these, and everything else that you think other readers here might find useful.